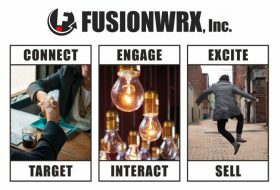 FUSIONWRX, Inc is a marketing engagement and activation agency that specializes in helping companies share their unique stories and find their niche in today’s competitive and ever-evolving marketplace. Working from our brick and mortar location in Crestview Hills, Kentucky, just over the river from Cincinnati, we are able to serve partners across the USA! Our digital footprint allows us to connect with you no matter where you are, as evidenced by our current portfolio including clients from Cincinnati to Texas to San Diego. Our portfolio includes St. Xavier High School, University of Cincinnati Lindner College of Business, University of Cincinnati Goering Center, Hardin Advanced Dentistry (West Chester, OH), San Diego Sleep Therapy (San Diego, CA), Sleep Dallas (Dallas, TX), Ft. Mitchell Farmers Market, City of Crestview Hills and Schubert Tennis. We have assisted these and many other businesses to CONNECT, ENGAGE and EXCITE their current and potential clients by defining what makes their businesses unique!